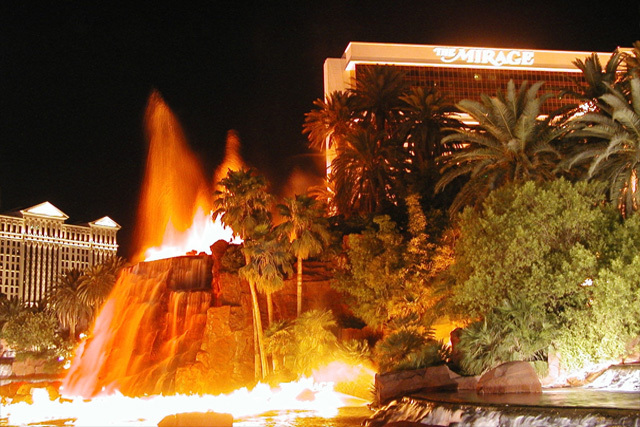 At the top of every hour, visitors to The Mirage can watch as the tranquil waterfall outside the hotel and casino transforms into the kind of molten lava that could blanket an exploding volcano. 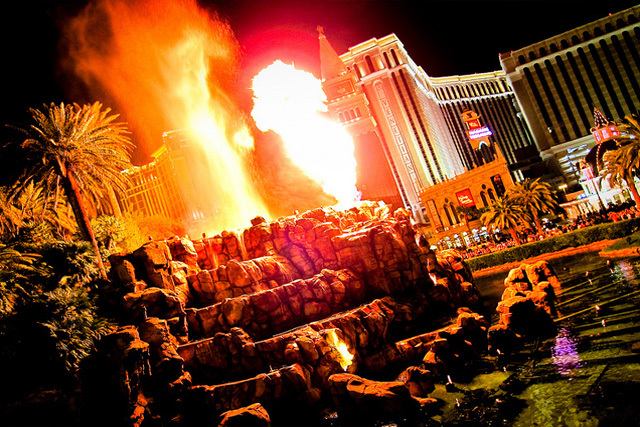 The Volcano at The Mirage has been an admittedly thunderous, key attraction in Las Vegas since The Mirage opened in 1989. At nightfall is when the experience begins. In the beginning there is no notice save an eerie silence, which is abruptly broken by low rumblings. The eruption comes to life, shooting flames 100 feet into the air. If you are standing close enough, you will feel the heat emanating from the volcano. After a few more smaller eruptions, the volcano returns to its dormant state. The lagoon in which the volcano is located runs from the Forum Shops entrance on the Strip to Treasure Island, and features many other landscape formations including tropical terrain, waterfalls and sculptures.